Pursued relentlessly by goblin hunters for the ancient secret he knows, Edmund the stuttering librarian, fights back in the fast-paced sequel to the epic fantasy novel, RIDDLE IN STONE. Edmund’s old, boring life is gone forever. Knowing the answer to a cryptic riddle that, if in the wrong hands, could destroy all of humanity, Edmund is hiding in a sleepy coastal town as far from the frozen mountains of the Undead King as possible. For a moment, he believes he’s finally safe. Then he learns that Molly, the woman he’s loved since childhood, is telling stories about him - stories that will get him and his friends killed. Edmund is forced to embark on a perilous journey home to confront the woman who broke his heart. If he fails, all will be lost. ©2013 Robert Cimera (P)2013 Audible, Inc. Certainly would - I liked the way the story and characters evolved and was quite enthralled in a number of spots. If you could sum up Betrayal in the Highlands in three words, what would they be? I really enjoy the way the author is building the characters and laying the foundation for a great climax. No, I have not however his formal tone does take a while to get past the ear. His enunciation can get a little over the top but it certainly does suit the character as a librarian. The "3rd voice" of his ego or inner thinking can get a little irritating but is pretty realistic in how I would deal with a situation and the reasoning I would go through so I guess its good. That said, Edmund, get on with it and kill something! Absolutely. Usually second books in series are boring. But this one does a nice job transitioning from the initial story in Riddle in Stone to the broader storyline. It introduces two brilliant characters--Abby, a strong-willed, girl who wants to be an adventurer, and Fatty, an enormous man who can't speak, but gets his hearrt-tugging points across. Wish there was more goblins. Ed, of course. He's the most realistic and atypical fantasy character I've ever come across. He's a regular guy with all the craziness of a typical person. And Pond Scum, happy, ever loyal. And Becky! The puppy from hell. LOL. Yes! I listened to it in two or three sitting. Didn't want to turn it off! Wonderful read. Highly recommended if you like good, character-driven stories. 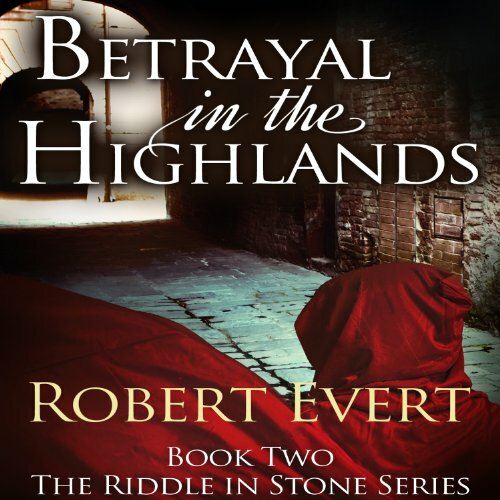 Betrayal in the Highland was a great continuation of the first book in the series Riddle in Stone. The hero Edmund definitely grows into his hero shoes in this book, but he is definitely still not your typical cookie cutter hero. The antics of Edmund and his eclectic group of friends kept me interested from start to end. The right amount of humour, grit, adventure and goblins left me with a book that I did not want to put down. This series has put Robert Evert into my list of favourite authors along with Kevin Hearne, Brandon Sanderson, Jim Butcher, Peter V Brett, Patrick Rothfuss and Michael J Sullivan. If you enjoy their books, you should check out the Riddle in Stone series. Would you consider the audio edition of Betrayal in the Highlands to be better than the print version? I love how devoted the characters are to each other. This is not epic fantasy. If you are looking for something deep like George R.R. Martin, Abercrombie, or Jordan, you may be disappointed. If you want a break from heavy politics and war this is a great book. Wonderful story, wonderful characters. It is not a shallow book, it is just not rife with politics and war. I thoroughly enjoyed the first book and the second was just as enjoyable. What made the experience of listening to Betrayal in the Highlands the most enjoyable? This story is something i've never read before, with the most unlikely hero I've ever heard of. A middle aged, balding, stuttering scholar, turned into the hero of the book. What other book might you compare Betrayal in the Highlands to and why? In terms of how it's written, i'd say Roberts writing is as easly and interesting to read as David Eddings, however his story is darker than said author. I'm so looking forward to the next part of the serie. Robert is definatly my favorite upcomer when it comes to fantasy stories! This a poor book. It follows directly after the events in the first book. The first book had faults but the novel story kept me going. In this one nothing really happens - I fell asleep for an hour one night whilst listening and it didn't make much difference. There are various plot holes and all the secondary characters are all idiots. What would have made Betrayal in the Highlands better? The book could have had some substance. The first 20ish chapters are basically an internal monologue whilst Ed tries to repeatedly talk himself into/out of doing something. Would you ever listen to anything by Robert Evert again? Would you listen to another book narrated by Fleet Cooper? If you could play editor, what scene or scenes would you have cut from Betrayal in the Highlands? 2nd book of a great series. I haven't read the printed version, but the narrator sets a really good pace and holds my attention. What other book might you compare Betrayal in the Highlands to, and why? Its a sequel to Riddle in stone, a 3 part story (3rd book wasn't available on Audible when I wrote this). I haven't read a great lot... its a fantasy adventure with a medieval setting. The protagonist starts off sick of his dull life and longs for adventure, early on he has his regrets - nothing seems to go the way he planned, but he becomes a stronger person overall for it, albeit at a greater cost than he ever imagined. I was really moved by Edmund and his progression from a shy pushover to a brave adventurer. I was pretty sad after what happened with his companion. don't want to give out too many spoilers, its a good read and you have to just discover this little gem for yourself. There is a 3rd book in the series, I hope it lands at Audible soon. Robert Everts first series and well done!! Characters keep you interested in this dark and gritty novel!! Roll on more about Edmund, Kravel and Mr Gerding!! Worth waiting for, a good second book. What did you like most about Betrayal in the Highlands? This is a good continuation of the story started with "The Riddle in Stone". As an older reader it is great to see a believable accidental hero of similar age struggle with evil, stupidity and romance! We learn more about Edmund, Pond and their backgrounds, we encounter new and old enemies. If you’ve listened to books by Robert Evert before, how does this one compare? I am (only) slightly disappointed. The first book was very different from anything I had listened to before - I was thrilled to see this second book was available. But it doesn't move the series very far, it does revisit a lot of the first book's elements. However we learn that there is more to worry about than just the Undead King, Edmund learns more about himself and Pond. Its a good story with great central characters and I can't wait for the third to come out. I imagine Mr. Cooper in a smoking jacket, sitting in a wing-backed chair, by a roaring fire reading from a leather-bound book illuminated by gas light. The style is quite theatrical and plummy - a sword is a sWord. This adds to the fun of the story and somehow works well for Edmund's character. I listened to this book on my way to and from work in the privacy of my car; at times I smiled with happiness and occasionally it made me sad.